Sir Michael Spicer MP and Harriett Baldwin have today written to Ms Rose Poulter, Director of Policy for the West Midlands Regional Assembly, in response to the Assembly's consultation paper about proposed house building targets for the region. "At the root of our criticism lies our view that this whole approach to planning is fundamentally wrong. It is most disturbing that the Regional Assembly, an unelected agency of government, should now have the final word in planning matters. The present system where the planning authority is elected, reflective of local opinion and whose decisions are subject to appeal, has served this country very well. It is totally unsatisfactory for the Government to have changed this system so dramatically to one which is undemocratic and remote from local needs. A future Conservative government will certainly abolish the new arrangements." We are writing to add emphasis to some of the points made in the comprehensive response to the Regional Spatial Strategy Phase 2 provided jointly by the Malvern Hills, Wychavon and Worcester Councils. Our comments reflect only the area of the West Worcestershire Parliamentary Constituency as currently constituted and incorporating the future changes recommended by the Boundary Commissioner, which incorporate the Teme Valley and Tenbury Wells. Recommendation 1 - involve the parish and town councils directly in the consultation process. .The Regional Spatial Strategy is driven by a top-down approach to developing housing targets and this does not help build support in the communities themselves for housing targets that can sound very large. A better approach would be to work from the bottom up and ask all of the parish and town councils for their housing needs as reflected in their parish plans and this would make the whole process more acceptable to the communities. Most of our communities welcome some growth; many have primary schools that are not currently at capacity and all communities express a desire to see more affordable housing to accommodate the desire of young people to remain within the communities where they grew up. Recommendation 2 - use much longer term average historic periods to project forward the population growth for the region. The Housing Demand Paper bases the population growth for the region on an estimate of net inward migration of 11,000 per annum. In fact Figure 1 in Section 2.19 shows that this high level of international inward migration has only occurred since 2001. This reflects the enlargement of the EU and the current government policy towards migration. The Regional Spatial Strategy projects this level forwards to 2026. All projections are subject to the quality of the underlying assumptions, but a more reasonable length of time to use for such a long term projection might be the average level of the last 13 years in Figure 1, which is 6,000 per annum, or approximately half of your underlying assumptions. Recommendation 3 - the infrastructure is already over capacity and this needs to be addressed before growth can occur. Very little growth can be accommodated in West Worcestershire without addressing infrastructure "pinch points". West Worcestershire's main population centre is Malvern. It is a potential strategic employment growth site in your report and Qinetiq is an important employer in an international context. However, access to Malvern is constrained by the limited number of crossing points on the River Severn and the report from the South Worcestershire Councils highlights this. Any growth needs to be predicated on improved access to the Western part of the County; in particular an additional crossing of the River Severn needs to be considered. 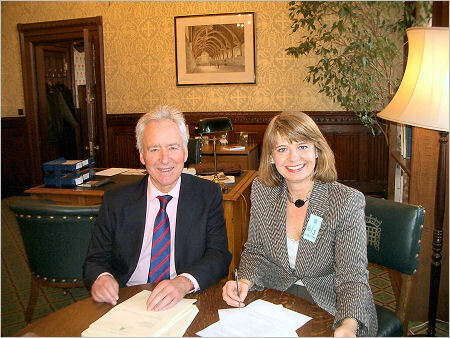 Photo: Harriett Baldwin with Sir Michael Spicer at the House of Commons.